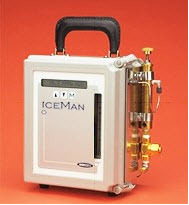 The Iceman addresses the unique requirements of moisture analysis in HFC’s and refrigerants. Today’s alternative refrigerants call for the special temperature-controlled sample conditioning only the Iceman provides. Regardless of the environment, hot or cold, the Iceman automatically provides optimal consistency of the sample gas temperature.